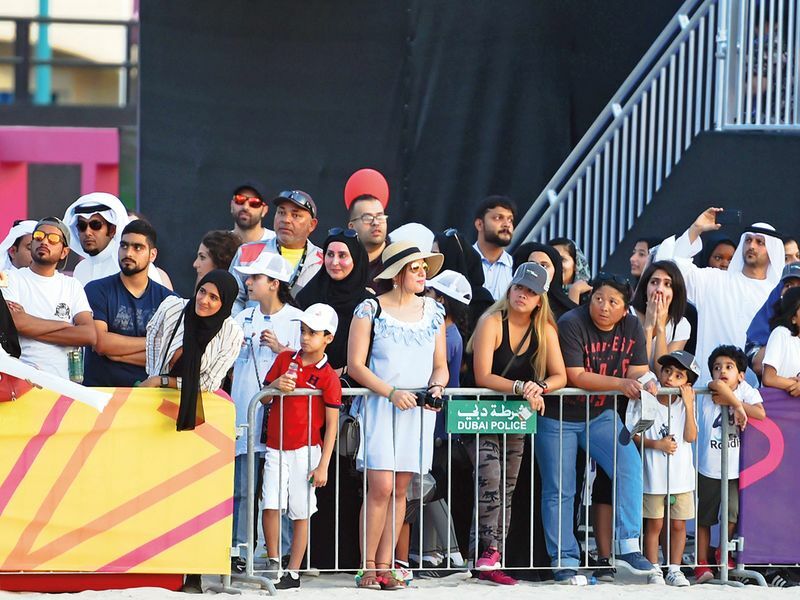 Dubai: Crown Prince of Dubai Shaikh Hamdan Bin Mohammad Bin Rashid Al Maktoum’s F3 team won the Gov-Games 2019 in the men’s and women’s segments yesterday, with Shaikh Hamdan himself leading the men’s team to a thrilling win for the second year in a row. The F3 men’s team finished the Battleship obstacle course in 24 minutes while the women’s team finished in 22 minutes. However the men’s course was considerably tougher, with no ladder to climb the curved wall and more weight to carry. In the men’s segment Abu Dhabi Police came a close second, followed by Dubai Police. 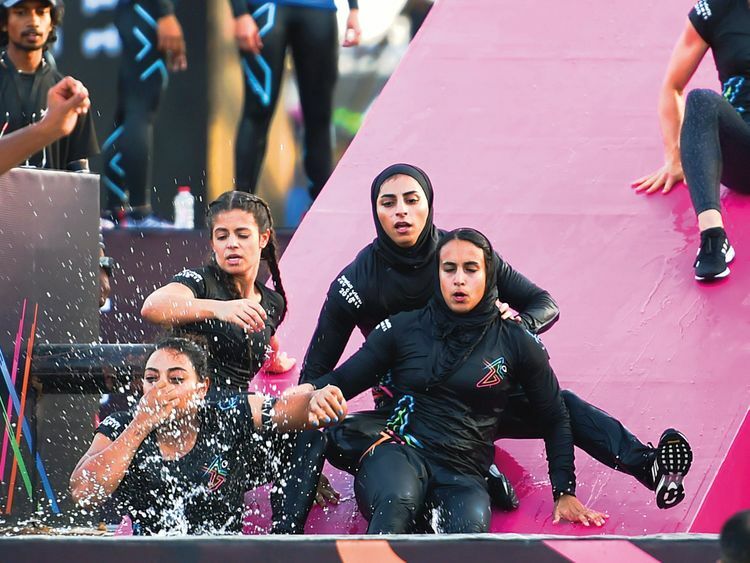 In the women’s segment, Team Dewa was the second team to complete the course successfully in the 47th minute, while Dubai Airports was third. The winning teams took home Dh1 million each, while runners-up received Dh300,000 each and the second runners-up got Dh200,000 per team. Shaikha Latifa Bint Mohammad Bin Rashid Al Maktoum, Deputy Chairwoman of Dubai Culture and Shaikh Hamdan distributed the prizes. The Battleship Course involved going through the various sections of the obstacle such as climbing a curved wall, rope climbing, passing through tubes, tightrope walking, ziplining, wading through freezing water and seesawing as a team, before working a pole through a maze without touching the sides and finally breaking a cement ball with a hammer to find a key and unlock the final stage. The men had to break two cement balls and find two keys to unlock the last stretch of the course, compared to the women’s one. The final stretch involved running, wading through sea water and crawling on sand wearing 20kg vests (additional heavy sandbags for men) for 800 metres towards the finish line. Both the F3 teams appeared to breeze through the stages while other teams struggled their way through. 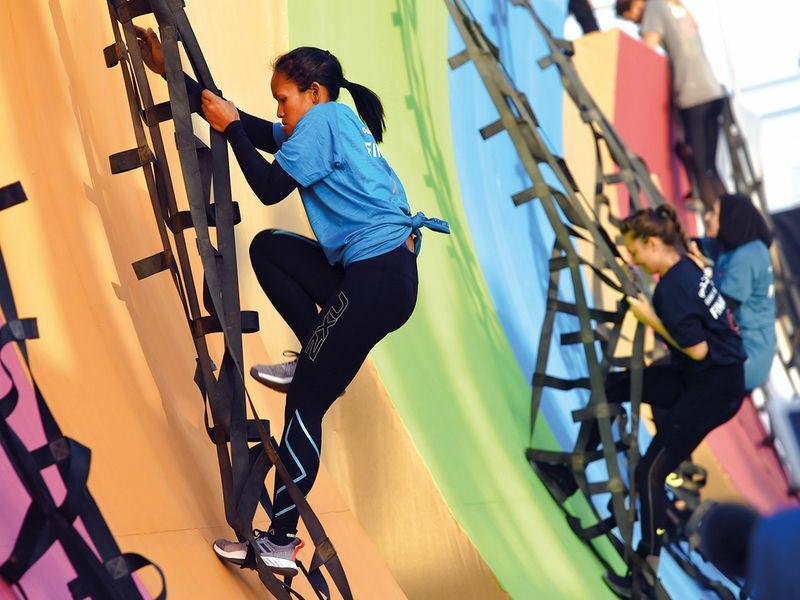 The obstacles had a one hour cap for women and 45 minutes for men. Over the last three days, six teams each from the male and female segments qualified for the finals that saw participants stretch the sinews of their muscles, while working their minds into overdrive, to ensure they remained afloat.